Dr. Pomerance has been a featured guest on more than 1,600 radio programs including local and NBC, ABC, CBS , Fox and NPR affiliates nationwide. She has been a featured guest on The Joey Reynolds Show on WOR and on Sirius Satellite Radio and Web M.D. She has also been a guest expert on such nationally syndicated TV programs as “Fox and Friends” “Fox 4 KDFW Good Day”, featured guest on “CNN National Headline News”, Lifetime TV’s “The Balancing Act”, Time-Warner Cable’s “Conversations Cafe”, “The Daily Buzz”, “Montel Williams”, Hallmark Channel’s “New Morning” and “Your Health” as well as a guest on the Dallas/Fort Worth affiliated network stations and stations throughout the country and Canada. She and her canine “kids”have been featured in the Dallas Morning News “Metropolitan” section, the cover of City & Country Pets and the cover of the Fort Worth Star-Telegram “Today” section. She has been interviewed and/or featured in such newspapers and magazines and websites as: MSNBC, The Los Angeles Daily News, The Dallas Morning News, The Fort Worth Star Telegram “Today Section”, “D” Magazine, The Washington Times, Good Housekeeping, Redbook, Woman’s Day (Woman’s Day.com) Woman’s World, Ladies Home Journal, Quick & Simple, Mary Engelbreit’s Home Companion Magazine, Dog Fancy and Cat Fancy, and Martha Stewart Living, etc. “The Balancing Act” with Dr. Diane Pomerance. 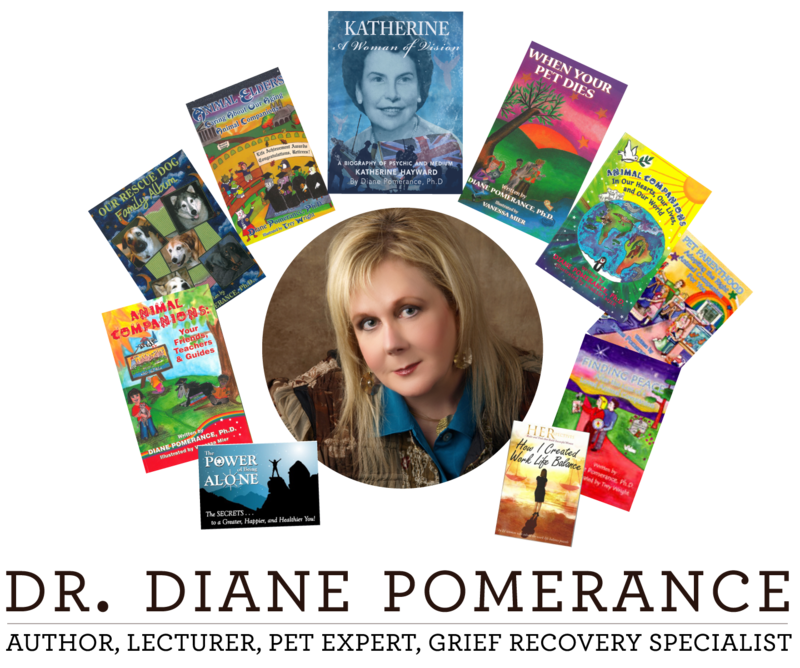 “The Daily Buzz” with Diane Pomerance, Ph.D.
FOX News with Diane Pomerance, Ph.D.
Fox News Interview with Diane Pomerance, Ph.D.
“K9 Kids” DTV Newsbreak with Diane Pomerance, Ph.D.
“DFW Closeup” KDAF Dallas with Dr. Diane Pomerance. “Loss of a Pet” CBS 11 News at Ten with Diane Pomerance, Ph.D, KTVT Dallas/Fort Worth. “Fox News and Friends- Animals Left Behind by Foreclosure” with Diane Pomerance, Ph.d, Fox News. “New Morning” with Dr. Diane Pomerance, Hallmark Channel. “Great Day Houston” with Diane Pomerance, Ph.D.
“Our Rescue Dog Family Album” Day Break USA via USA Radio Network with Diane Pomerance, Ph.D.
“Pet Parenthood” Interview with Diane Pomerance, Ph.D via FOX 7 News Austin. “Pet Adoption” via KFDA-TV Amarillo Morning News with Diane Pomerance, Ph.D.
“Adopting Pets” via KAAB Fox with Diane Pomerance, Ph.D.
“Pets at Christmas- Happening Now” via Fox News with Diane Pomerance, Ph.D.
“Grieving the Loss of a Pet” via WFAA Channel 8 ABC Dallas with Diane Pomerance, Ph.D.
“Who Let the Dogs Out?” The Pomerance Family and Their Dogs.